The plenary vote at the House of Representatives on whether or not to impeach Ombudsman Merceditas Gutierrez on Monday would be more about the fate of the Liberal Party (LP) at the legislature rather than Merci’s future in government service. The crucial vote would be a test on the clout of Noynoy’s party where it should be exerting it, at the 284-member chamber that has as its Speaker also a member of the party. At stake are major legislative initiatives of Noynoy to push his supposed reform thrusts forward. Merci, nevertheless, would be a key battleground for the LP since Noynoy and every partymate of his has been committed to her removal since the day Noynoy stepped into Malacañang. Bullying tactics are being resorted to by Noynoy and his boys in getting Merci Gutierrez impeached by the House on a plenary vote, and there appears to be strong proof of this threatening stance of the Palace occupant and his House lapdogs. A threatening text message from Cavite Rep. Joseph Emilio Abaya has made the congressional rounds, the gist of which is that those congressmen who will abstain, or absent themselves, or vote no to the impeachment complaint in plenary will not be given their pork barrel. The pork barrel given was still that of last year, and the 2011 pork barrel is still being dangled by Noynoy. It certainly looks like the Liberal Party, despite its boast of having well over 150 yes votes to impeach Merci, may not have the numbers at all, which is why Noynoy’s LPs reportedly are in a panic mode these days. MOSCOW — From seeding clouds to reviving agricultural land, Moscow’s experience after Chernobyl can be used by Japan as it tries to contain damage from its quake-hit nuclear plant, Russian experts said. Concerns have grown over the unraveling crisis at the Fukushima power station as Japan struggles to cool down nuclear fuel rods after cooling systems were knocked out by the devastating earthquake and tsunami. While the scope of the catastrophe is not likely to reach the levels of the 1986 Chernobyl disaster under the Soviet Union, Russian experts said Japan could minimize damage by using its experience like seeding clouds and recultivating agricultural land. POKHARA — When Nepal’s Chhetri sisters started their all-female trekking agency in the mid-1990s, the idea was so alien to local people that many thought it must be a cover story for a brothel. For Nepalese women to set up in business was unusual enough. For them to venture out onto remote Himalayan trails, often for weeks at a time and in the company of strangers, was completely unheard of. But if their compatriots in this conservative, majority-Hindu nation were initially shocked by the three women’s venture, the rest of the world’s reaction to their 3 Sisters trekking agency has been overwhelmingly positive. With all the natural and man-made calamities inundating the world these days, it has seemed to me that our kababayans abroad have been forced to find their way back to the motherland, notwithstanding their reasons for leaving in the first place. The situations in Egypt, then Libya, Bahrain and Japan have, in turn, pushed the Philippine government to act, and act fast, on repatriating Pinoys. Overseas workers’ organizations, however, have observed (nay, complained loudly) about one thing through all the worldwide ruckus: the slowness and vagueness of concerned agencies in seeing to the needs of Filipino citizens. Michael Salvador of San Fernando, Pampanga had his passport ready in the event of luck smiling his way. He wanted to work overseas, where at 25, it isn’t late yet to find his fortune that could build him a house, buy him a decent car, and start a small business once he settles back home after five or 10 years. But his dreams crumbled in his face on June 30 last year, when the TSI manpower agency which had deployed him as a promotions merchandiser for one of the leading electronics firms in the country suddenly terminated his contract. It was his stepping stone to finding a job abroad. Agnotology is a neologism on the study of culturally-induced ignorance or doubt, particularly as this relates to the publication of inaccurate or misleading scientific data. And since the press and media shape 70 percent of what’s known to be culture and knowledge today, it would be more accurate to also include media-induced ignorance through their selective information and news. In the three literally burning issues of the day, many problems in people’s understanding of the truth are symptomatic of the agnotological conditions perpetrated by news media and the dominant information system hegemonies of the world. From the Fukushima crisis in Japan, to the Libyan struggle in North Africa, to the pro- and anti-nuclear as well as the pro- and anti-Merci impeachment debates in our own setting, the deliberate inducement of ignorance have all led to adverse consequences for people everywhere. In the nuclear fall-out crisis stemming from the Fukushima reactors’ failures and radiation emissions, we find a culturally-induced ignorance of the Japanese people toward complacency with regard to their authorities’ abuses and unreliability. Japanese power plant officials, for one, kept everyone ignorant of very vital information. In the first few days, no one was given an inkling as to the enormity of the problem. It was only when one nuclear reactor after another gave way that a clear admission that at least four of them were in really serious trouble came out. Despite this, the Japanese continued to be very trusting of their nuclear authorities, even after threatening radiation levels reached beyond the 20 to 30-mile radius. What we’re witnessing here is a case of “structured ignorance.” It took criticism from cultures less trusting of authorities against Japan’s niggardly crisis updates to alert everyone of the mortal dangers in this unfolding crisis. Still, this hasn’t been the worst of the lot. In the case of Libya , where media-induced ignorance through blatant misinformation and disinformation are being used to justify a foreign-backed coup d’etat and eventual Nato oil and land grab, so-called “Allied” fighter jets are now pounding on Tripoli as of posting time. Al Jazeera was at the forefront of this disinformation and misinformation campaign, starting with its unsubstantiated reports (and later proven false by Russian satellite monitoring) of Gaddafi forces and war planes mowing down unarmed civilian demonstrators. In all video docus from Libya I have seen, the anti-Gaddafi forces were always heavily armed. While there are those who see Al Jazeera as an alternative to CNN and BBC, it actually plays a complementary role through its more subtle information subversion as it appears to be less pro-West than it actually is. Al Jazeera, for instance, pumped up demonstration casualties to “thousands,” even when these later turned out to be only over a hundred. Such exaggeration was especially blatant considering the fact that even as the turmoil in Libya entered its third week, with a full scale battle in the city of Misrata, the real casualty figure there numbered only 25. By and large, Al Jazeera’s interviews and panel discussions hardly ever feature the side of Gaddafi or the voices of pro-Gaddafi people on the ground. And as the Gaddafi counter-offensive gained ground, it became clear, too, that the alleged “total loss of popular support” for the Libyan strongman was completely false. Yet, Al Jazeera’s on-site reporters kept on annotating their news with a blatant anti-Gaddafi virulence. One of the most obvious lies Western media and the anti-Gaddafi forces tried to foist on the world in the first week of the conflict was that the Libyan opposition movement abhors foreign intervention even to support its cause. But not long after Gaddafi’s counter-offensive successes and before the UN “No Fly Zone” resolution, the anti-Gaddafis in Benghazi were literally begging for it and jubilated when Nato promised to start arming them and bombing pro-Gaddafi Libyans for a grand bloodbath of Arab blood. With Nato and monarchist anti-Gaddafi forces collaborating, an oil and land grab that will “Balkanize” Libya isn’t too far in the horizon. But more devastation will follow, just as what invading forces did to Iraq. As the world continues to be kept ignorant of the systematic destruction of the cultural heritage and infrastructure of Iraq by its occupying forces, this is the crux of what Felicity Arbuthnot wrote in a recent article about Libya: The bombing of Libya will begin on or nearly to the day of the 18th anniversary of the beginning of the destruction of Iraq, 19th March (in Europe). Libya, too, will be destroyed — its schools, education system, water, infrastructure, hospitals, and municipal buildings. There will be numerous “tragic mistakes” and “collateral damage,” involving mothers, fathers, children, babies, grandparents, the blind and the deaf, and so on. And like the wonders of past empire’s remains, as with these nations’ rich histories (Iraq and Afghanistan), Libya’s, too, will be gone… forever. Both the pro- and anti-nuclear power lobbies are definitely creating ignorance of the only true alternative — geothermal energy, of which the Philippine has limitless potential. Meantime, in the Merci impeachment moro-moro, the nation is being kept ignorant of the fact that both sides are similarly corrupted and will never work to sustain the “Rule of Law” when they all threw this away and resorted to the “Rule of Force” in the case of President Joseph Estrada. Truly, the facts are there for all to see; and only an agnotological media will continue to befuddle the issues to the people’s detriment. The impeachment bid against Ombudsman Merceditas Gutierrez is all but dead after the unnecessary disclosure by Iloilo Rep. Niel Tupas Jr., chairman of the House committee on justice, of the Iglesia Ni Cristo’s (INC) alleged lobbying in favor of Gutierrez and the supposed “no impeachment, no pork barrel” threat through a text message on lawmakers, several legislators indicated yesterday. Legislators viewed the twin strategies as an admission of defeat on the part of the pro-administration Liberal Party and other pro-impeachment solons, bolstering wide perception that the impeachment case against Gutierrez was weak and that the House may have a hard time convincing the Senate to convict her. The impeachment complaint is scheduled to be put into a vote in plenary either today or tomorrow. US, British and French forces hammered Libya from the air and sea, prompting leader Moamer Kadhafi to warn yesterday of a long war in the Mediterranean “battlefield” as Tripoli reported dozens of deaths. China, however, expressed regret over the multinational air strikes, saying in a foreign ministry statement that it opposed the use of force in international relations. “China has noted the latest developments in Libya and expresses regret over the military attacks on Libya,” the statement said. At least 2,300 Filipino nurses have refused to be evacuated even after the United Nations approved military strikes against Libya. Acting Foreign Affairs Secretary Albert del Rosario said the nurses, 2,000 of whom are based in capital Tripoli and 383 in the rebel stronghold of Benghazi, opted to stay following request from the Libyan government, which promised to increase their pay significantly if they remain. The Armed Forces of the Philippines was rocked yesterday by a fresh “torture” video purporting to show troops abusing train-ees as it moved to cleanse its ranks of rogue soldiers. The 14-minute video uploaded on Youtube showed soldiers beating a group of young recruits using ropes and sticks as loud screams could be heard in the background. The death toll brought about by continuous heavy rains in some parts of Visayas and Mindanao rose to 11 people while four others went missing as the number of the flood-affected residents increased to almost 30,000 families, the National Disaster Risk Reduction and Management Council (NDRRMC) reported yesterday. Former Rep. Abdullah Dimaporo disputed the allegations made by the Philippine National Police (PNP) that Lanao del Norte is one of the “unsafe places” based on the survey conducted by the government-owned Philippine News Agency (PNA)recently. The report was fed by PNP to police reporters and carried out by the reporters’ newspapers publications nationwide and even globally through its Web sites. According to Dimaporo, the report was damaging to Lanao del Norte province as the province itself is generally peaceful and even peaceful as compared with Metro Manila. Of course, there were crimes committed by unlawful persons in Lanao del Norte but it happens everywhere either in provinces or in Metro Manila. Actor John John Apacible was gunned down by his uncle early yesterday morning in Cainta, Rizal after a heated argument. Initial reports said Apacible was shot by his uncle when they had a heated argument during their drinking bout. Apacible succumbed to two gunshot wounds in the chest. A member of the House of Representatives yesterday bared they will summon Finance Secretary Cesar Purisima to appear in its Question Hour if he does not accede to the recommendation of Internal Revenue Commissioner Kim Jacinto-Henares to withdraw Revenue Regulation 02-2011 requiring certain individual citizens, resident aliens and non-resident aliens engaged in trade or business in the country to file their Annual Information Return (AIR). Valenzuela Rep. Magtanggol Gunigundo made the manifestation for Purisima’s appearance in the Question Hour during the hearing of the House committee on ways and means on Tuesday on the controversial AIR regulation issued last March 1. Indians activate SS Francisco Lindor off 10-day IL - Cleveland Indians shortstop Francisco Lindor has been activated off the 10-day injured list, and will be in the team's lineup Saturday. Australian Fights to Save Her Grandchildren From Syrian Refugee Camp - Karen Nettleton spent the past five years searching for her grandchildren, whose father was an ISIS fighter. Now their fate has become a political football. Notre-Dame fire: How gamers are getting 'inside' the cathedral - Players return to a 2014 video game to visit a digital version of the cathedral, untouched by fire. 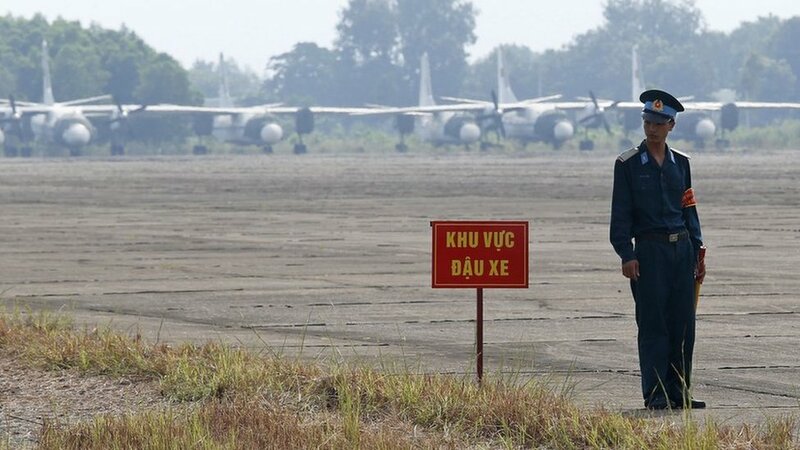 Agent Orange: US to clean up toxic Vietnam War air base - The operation, unveiled more than four decades after the end of the Vietnam War, will cost $183m. Rites of Passage: ‘Will You Stay With Me Until I Die?’ - My patient had a simple, devastating request. To honor it meant grappling with how a therapist responds to her clients. Mars 2020 Rover Assembled and Tested Ahead of Launch Next Year - Technicians have assembled the capsule that will keep NASA's Mars 2020 rover secure for its wild ride to the Red Planet's surface.